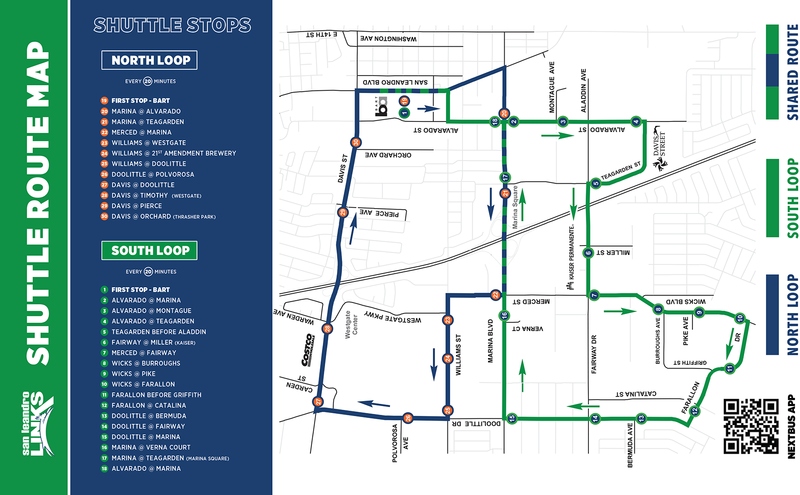 The San Leandro LINKS Shuttle is now easier to use than ever! Just download the Nextbus app or go to Nextbus.com to see how soon your bus will arrive. Just download the Nextbus app to find your bus and see how soon it will arrive. Since its inception in 2001, the LINKS shuttle has served businesses in West San Leandro by providing a free transportation link between places of employment and the Downtown San Leandro BART Station. LINKS receives overwhelmingly positive feedback from riders and ridership has grown over the past decade. LINKS is funded through a variety of sources including regional grants. A significant portion of the funding comes from a Business Improvement District (BID) that is formed by businesses within 1/4 mile of the shuttle route. LINKS is managed by the San Leandro Transportation Management Organization (SLTMO), a non-profit organization with representation from local businesses and the City of San Leandro. Funding for LINKS comes from grants, the City of San Leandro, business and property-owner partnerships, and the West San Leandro Business Improvement District (BID). The BID covers about 50% of the total operating budget and is made up of businesses along the LINKS route. Bay Area Air Quality Management District requires all employers with 50 or more full-time employees to provide commuter benefits to their employees. Employers must select one (or more) of four commuter benefit options and register with the program by September 30, 2014. Participation in the LINKS Business Improvement District satisfies Option 3 (“Employer Provided Transit”) under the new BAAQMD program, allowing businesses to save both time and money. Wow, I can’t believe how easy it is to hop aboard and get exactly where I want to go. San Leandro isn’t that big, but the LINKS sure makes it easier getting around. Everyone is pleasant, including the driver, not to mention it’s always clean and FREE!